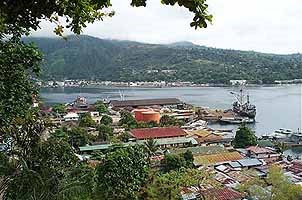 Jayapura is the capital and the biggest city of this eastern most province. It is a neat and pleasant city, built on the slope of a hill overlooking the bay. General Douglas Mc Arthur’s World War II quarters still stand here. The Museum Jayapura is located on the Cendrawasih University campus. Tanjung Ria Beach, known as base G by the Allies during World War II, is a popular holiday resort with facilities for water sport.